can someone tell me where i can get a wiring schematic for a sand rail? I just got a rail given to me, and the wiring is a mess. I need just the basics,,, just to get it fired up. It's an old one that's still 6V. I would like to convert it to 12. I have an extra externally regulated 12V generator and coil. For now, it's gonna be very basic. It's got a on/off switch for power and a push button switch for starting. Is there one for a alternator? Or is it the same? Which alt. do you have ? 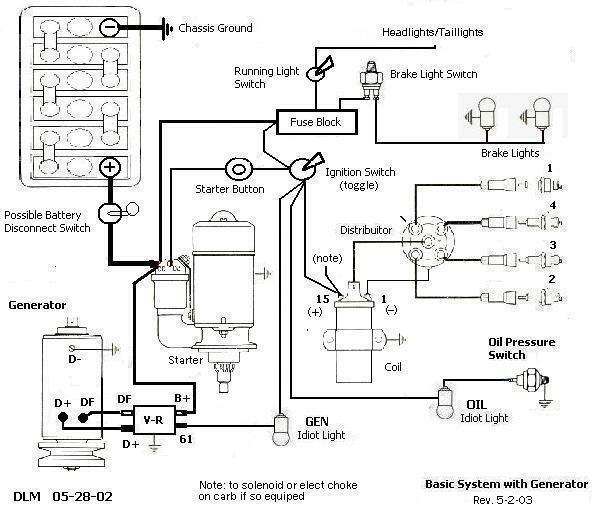 Ive tried this diagram but my motor does not turn off. Turns on fine though. Any ideas on what may be the problem. It sounds like you have a feed back from the alternator to ignition switch. Depending on what kind of ignition switch you have changing the wiring on the switch. One other thing you can do is install a diode inline in wiring to idiot light from alternator so voltage can go to alternator from switch and not the other way. Somewhere on this site a diagram of it has been posted of how to do it. could it be the coil always has power on, even when the key is off??? get a volt meter and find out, test ground to the + (15) terminal on the coil, that terminal should be zero volts except when the key switch is in the run and start positions. When the switch is in start or run position that terminal should have 12 volts on it. Problem could be as simple as a miss wire at the key switch such that the wire to the coil is constantly hooked up to the 12 volts supply wire at the switch. Will the motor stop if you pull the +(15) wire off the coil? If so that confirms you got 12 volts on that wire all the time. Is anything else hooked up to terminal +(15) at the coil? If you have a alternator... You can disconnect D+ wire for a test and if motor stops you need diode... Or disconnect D+ wire and start it up and shut it off, if it shuts off properly you need diode.. So then is it possible to a have a power leak backwards through the D+ line that drains the battery? Lately I've been having an issue with my battery being dead after a few days of not running. Engine starts and stops as normal but It seems I'm loosing .1 or .2 volts per day somehow, even if I pull all my fuses. Looking at the diagram (mine is wired almost the same way) it looks like the only way to have a drain that bypasses the fuse block is through the alternator. Homemade woods/street, bug out rail. IRS, Balljoint front end. 1967 1600cc DP, Weber 32/36 progressive, tri-mil quiet pack. Rear only cutting brakes. could happen the col would then be always on via the idiot light. Turn the key switch off and measure the voltage at the hot wire to the coil. remove the wire to measure voltage to ground, it should be zero if key is off. also see if the motor will turn off if you remove the idiot light bulb, if so that would confirm that is the problem. a diode could fix this, however if the system was not designed for this diode, why do not all the cars wired this way fail to shut off, could there be a diode in the alternator that has failed that causes you motor to not shut off? also be aware that you motor could be running on from dieseling. confirm this is not the case by removing the hot wire on the coil, if she still runs on, then the engine is dieseling. if she then stopped you know you have current on the wire that should not be there. Does battery go dead if disconnected for a few days? I dont have a volt meter as of now but i have a test light and it turns on when i touch the ignition post of the switch where i have the coil and i alsi have the d+ from alternator to that post. And i know my alternator charges cause i can discinnect bat. A diode will prevent feedback from alt.????? What would be that reason for gettin power from d+ on alt. ? Do you have idiot light in circuit? Thanks alot guys i put a diode in and it is now working. Turns off with the key. Anything i might have to look out for in the future.? And i do not have an idiot light would it be a good idea to put one. And i know my alt. Is charging i put a voltmeter and it is reading 14.5. Yep. 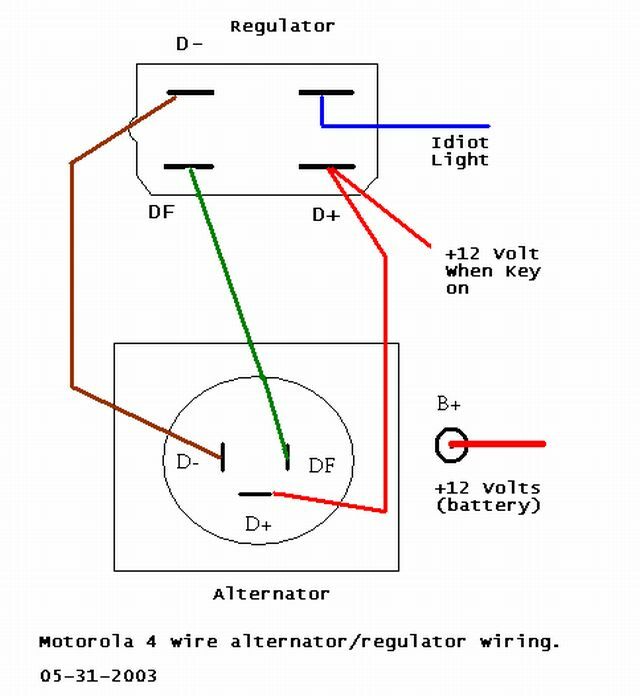 The idiot light isn't just a light, its a resistor that sets up the field charge to make the alternator work. It also has to be a 'real' light bulb, an LED won't cut it.